HTET 2019 - All about Haryana Teacher Eligibility Test (HTET) ✓ Notification ✓ Application Form ✓ Syllabus ✓ Admit Card ✓ Eligibility ✓ Question Papers ✓ Sample Papers ✓ Answer Key ✓ Exam Date ✓ Exam Pattern ✓ Preparation Tips for the post Level-1 (primary teacher – Class I to V), Level-2 (TGT teacher — Class VI to VIII) & Level-3 (PGT-lecturer) examination to be held in 2019. Candidates interested in appearing for the exam should apply only through online process from official website of Haryana TET i.e. www.htet.nic.in. The Government has Decided to Conduct The Haryana Teachers Eligibility Test – HTET 2019 Exam Once Again in the Current year to help more Number of Candidates to Apply for Haryana TET 2019 The State Government has announced the TET Haryana 2019 Latest Schedule now. 24.08.2019 - Latest News : HTET 2016-17 Examination Postponed. Please wait for revised schedule. Over 4.5 lakh candidates will be appearing in the HTET. i) who intends to be a teacher for classes I to V (Primary Teacher) and fulfills the minimum qualification. ii) who intends to be a teacher for classes VI to VIII (TGT – Trained Graduate Teacher) and fulfills the minimum qualification. iii) who intends to be a PGT (Post Graduate Teacher) and fulfills the minimum qualification. However, a person who intends to be a teacher for levels (i) and (ii) mentioned here above (i.e. Teacher for classes I to V and VI to VIII) and fulfils minimum qualifications for both levels will have to apply On-line for both separately. Similarly, if a person who also intends to be a lecturer and fulfils minimum qualifications, he/she will also have to apply On-line separately. Candidates are advised to follow the instructions as given on the website for submitting “On-line Application” for more than one levels. (iii) Matric with Hindi/ Sanskrit or 10+2/B.A./M.A. with Hindi as one of the subject. Graduation with Hindi as one of the Subjects. (ii) Matric with Hindi/Sanskrit or 10+2/B.A./M.A. with Hindi as one of the subject. (ii) Matric with Hindi / Sanskrit or 10+2/B.A./M.A. with Hindi as one of the subject. Candidates are required to apply online application form from the official website www.htet.nic.in . After successfully submission of application form, candidates need to take print out of duly filled application form for future references. SC & Differently abled of other state – Rs. 600/- (Per Level). 1. A person who scores 60% or more in the H-TET examination will be considered ‘HTET passed’ or ‘H-TET qualified’. This will be the qualifying marks for all categories. NATURE AND STANDARD OF QUESTIONS: The test items on Child Development and Pedagogy will focus on educational psychology of teaching and learning relevant to the age group of 6-11 years. They will focus on understanding the characteristics and needs of diverse learners, interaction with learners and the attributes and qualities of a good facilitator of learning. The Test items for Language – I (Hindi) will focus on the proficiencies related to the medium of instruction. · The Language II (English) will focus on the elements of language, communication and comprehension abilities. · The test items in Mathematics and Environmental Studies will focus on the concepts, problem solving abilities and pedagogical understanding of 17 the subjects. In all these subject areas, the test items shall be evenly distributed over different divisions of the syllabus of that subject prescribed for classes I-V by the Education Department, Govt. of Haryana. · The questions in the tests for Level-I will be based on the topics of the prescribed syllabus for classes I-V, but their difficulty standard, as well as linkages, could be upto the secondary stage. (c) For Hindi/English/Sanskrit/Panjabi/Urdu/ Choose either (iv) (a) OR iv (b) Home Science/Physical Education/ 60 MCQs 60 Marks Art/Music Teacher. IMPORTANT NOTE The aforesaid content & structure of Level-2 is strictly in accordance with the policy laid down by the National Council for Teacher Education. As mentioned above, Section – (iv) is divided into two parts i.e. (a) for Math & Science teachers and (b) for Social Studies teacher. However these two parts (a) or (b) of section (iv) will be optional for Hindi/English/Sanskrit/Panjabi/Urdu/Home Science/Physical Education Teacher (DPE)/Music/Art teachers and therefore every candidate appearing for Level-2 for these subjects will have to fill up their option in the application form to be submitted online. Similarly every candidate of Level-2 will have to offer his/her choice of language for attempting 30 questions relating to section (iii), while submitting online application. · The test items on Child Development and Pedagogy will focus on educational psychology of teaching and learning, relevant to the age group of 14-17 years. They will focus on understanding the characteristics, needs and psychology of diverse learners, interaction with learners and the attributes and qualities of a good facilitator of learning. · The test items for language I (Hindi) will focus on the proficiency related to the medium of instruction relevant to the age group of 14-17 years. · The Language II (English) will focus on the elements of language, communication and comprehension abilities relevant to the age group of 14- 17 years. · The test items in subject specific will focus on the concepts, problem solving abilities and pedagogical understanding of these subjects. The test 20 items shall be evenly distributed over different divisions of the syllabus of that subject as prescribed for classes IX-XII by the Board of School Education Haryana. · The questions in the test will be based on the topics of the prescribed syllabus of the Board of School Education Haryana for classes IX-XII but their difficulty standard as well linkages could be upto the Post-Graduate level. ADMIT CARDS WILL NOT BE SENT BY POST. The admit card will be available on Board‟s website. Every eligible candidate may download his/her admit card from the website ( www.htet.nic.in) with effect from 20-08-2019 onwards and appear in the examination at the allotted examination centre. After taking print out of “Roll No./Admit Card”, go through the particulars etc. and if any discrepancy in the particulars of the candidate or his/her photograph and signatures is noticed, the candidate should immediately contact the Special Examination Branch of the Board and get the same corrected. In case the roll no. of the candidate is not uploaded on the Board's website ( www.htet.nic.in) by 20-08-2019, the candidate should approach the Special Examination Branch of the Board between 9.00 AM to 5.00 PM at least two days prior to the date of examination alongwith adequate proofs i.e. Photostat copy of Computer Generated Application form (“Confirmation Page”), a copy of payment challan in support of having deposited examination fee and an attested copy of certificate of having qualified Secondary(Xth Class) examination, two copies of photograph as uploaded on application form. 1:- Log on to the official website www.htet.nic.in. The candidates opting for CBT would be asked to give their choice for examination centre and out of the choices, one would be allotted as per availability. The applicants can deposit their application fee in HDFC, Union Bank of India or Oriental Bank of Commerce as per their convenience. For CBT, the application fee will be Rs 600 per level for general category and Rs 300 per level for Scheduled Castes (SC) and Disabled candidates belonging to Haryana, and Rs 600 per level for all candidates belonging to other states. STEP#01: Log on to official website of Haryana TET. to apply online for HTET. STEP#04: Fill and edit Haryana TET 2019 online application form. Similarly, for traditional paper based test (offline), the fee will be Rs 700 per level for general category, Rs 350 per level for SC and disabled candidates belonging to Haryana, and Rs 700 per level for all candidates belonging to other states. Plz provide topic vise Syllabus for PGT Computer Science. 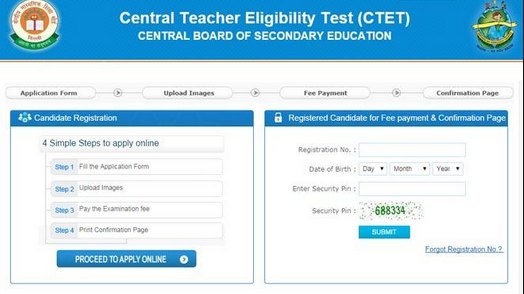 b.tech passouts are eligible or not for ctet and htet.